Background/Aims: Recently, water exchange (WE) instead of water immersion (WI) for colonoscopy has been proposed to decrease pain and improve adenoma detection rate (ADR). This systematic review and meta-analysis is conducted to assess whether WE is superior to WI based on the published randomized controlled trials (RCTs). Materials and Methods: We searched studies from PubMed, Cochrane Central Register of Controlled Trials, EMBASE, and MEDLINE. Only RCTs were eligible for our study. The pooled risk ratios (RRs), pooled mean difference (MD), and pooled 95% confidence intervals (CIs) were calculated by using the fixed-effects model or random-effects model based on heterogeneity. Results: Five RCTs consisting of 2229 colonoscopies were included in this study. WE was associated with a significantly higher ADR than WI (RR = 1.18; CI = 1.05–1.32; P = 0.004), especially in right colon (RR = 1.31; CI = 1.07–1.61; P = 0.01). Compared with WI, WE was confirmed with lower pain score, higher Boston Bowel Preparation Scale score, but more infused water during insertion. There was no statistical difference between WE and WI in cecal intubation rate and the number of patients who had willingness to repeat the examination. Furthermore, both total procedure time and cecal intubation time in WE were significantly longer than that in WI (MD = 2.66; CI = 1.42–3.90; P < 0.0001; vs MD = 4.58; CI = 4.01–5.15; P < 0.0001). 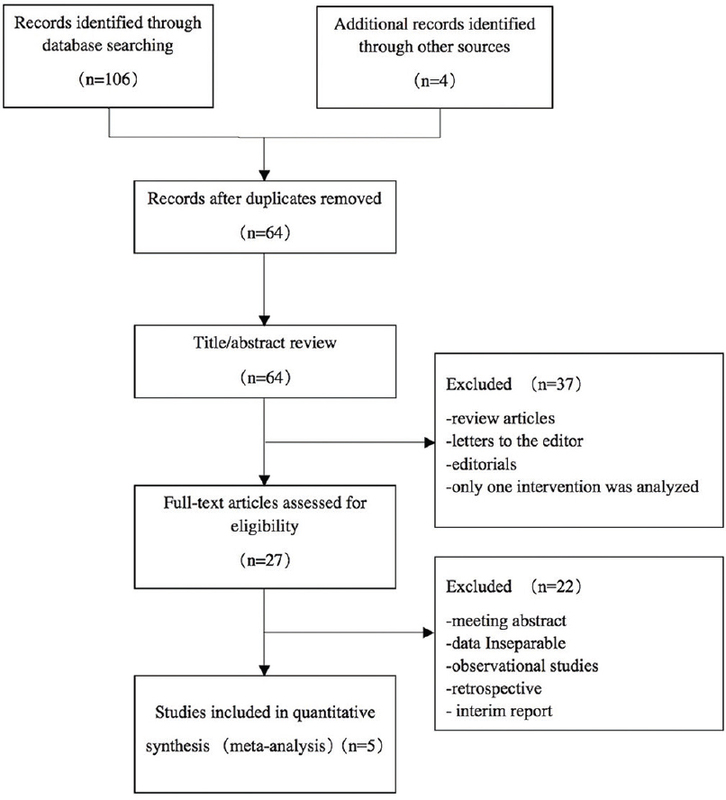 Conclusions: This meta-analysis supports the hypothesis that WE is superior to WI in improving ADR, attenuating insertion pain and providing better bowel cleansing, but inferior in time and consumption of infused water consumption during insertion. 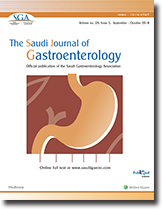 Background/Aim: To determine the frequency of celiac disease (CD)-predisposing human leukocyte antigen (HLA)-DQ genotypes in the Saudi population, where the prevalence of CD is 1.5% as recently reported in a mass screening study. Patients and Methods: In a cross-sectional population-based study, a total of 192 randomly selected healthy school children (97 females, mean age 10.5 ± 2.2 years, all negative for tissue transglutaminase-IgA) were typed for D QA1 and D QB1 genes by polymerase chain reaction sequence–specific oligonucleotide probes. Results: Of the 192 children, 52.7% carried the high-risk CD-associated HLA-DQ molecules: homozygous DQ2.5 ( 2.6%), DQ2.5/DQ2.2 ( 4.7%), heterozygous DQ2.5 ( 28.15%), homozygous DQ8 ( 4.2%), DQ8/DQ2.2 ( 3.6%), and double dose DQ2.2 ( 9.4%). 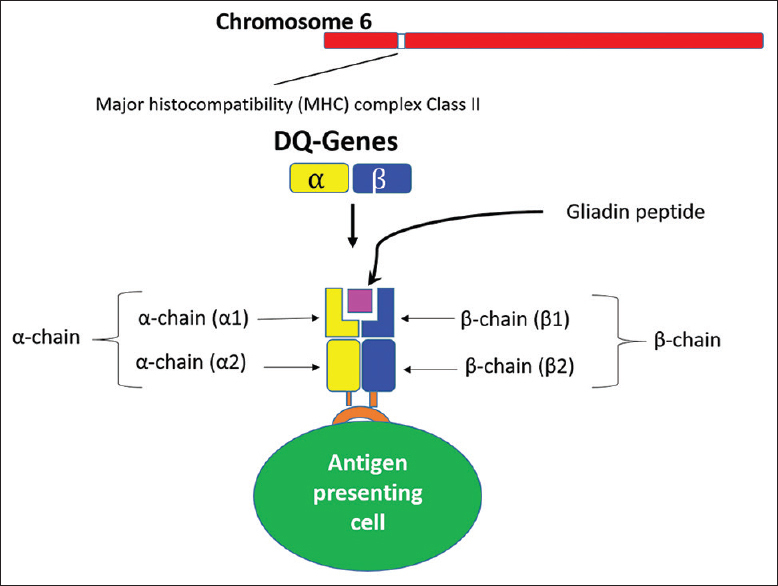 Low-risk CD-associated HLA-DQ molecules (single dose DQ2.2 and heterozygous DQ8) constituted 3.6% and 9.4%, respectively. Among the very low–risk groups, individuals lacking alleles that contribute to DQ2/DQ8 variants (33.5%), 13.5% carried only one of the alleles of the high-risk HLA-DQ2.5 heterodimer called “half-heterodimer” (HLA-DQA1*05 in 12% and HLA-DQB1* 02 in 1.5%), and 20.8% lacked all the susceptible alleles (DQX.x). Gender distribution was not significantly different among the CD-risk groups. Conclusion: We report one of the highest frequencies of CD-predisposing HLA-DQ genotypes among healthy general populations (52.7%) worldwide, which might partly explain the high prevalence of CD in the Saudi community. 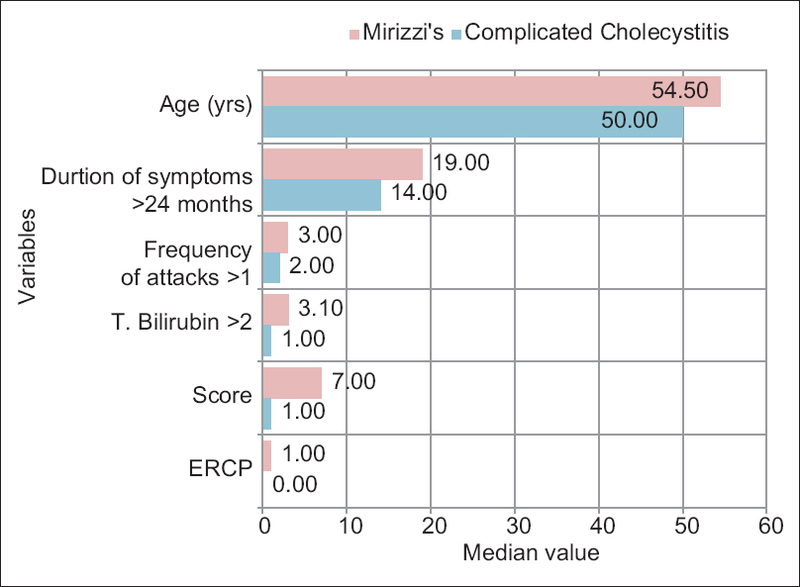 Background/Aim: Mirizzi's syndrome (MS) is an unusual complication of gallstone disease and occurs in approximately 1% of patients with cholelithiasis. Majority of cases are not identified preoperatively, despite the availability of modern imaging techniques. A preoperative diagnosis can forewarn the operating surgeon and avoid bile duct injuries in cases of complicated cholecystitis. A preoperative scoring system helpful and hence, we aim to devise a scoring system based on clinical, biochemical, and imaging features to predict the diagnosis of MS in cases of complicated cholecystitis. Patients and Methods: From January 2000 to July 2013, 1,539 patients with cholelithiasis underwent cholecystectomy. Of these, 96 patients had complicated cholecystitis. Records of these patients were analyzed retrospectively. In these, 32 patients were found to be having MS that formed the study group. 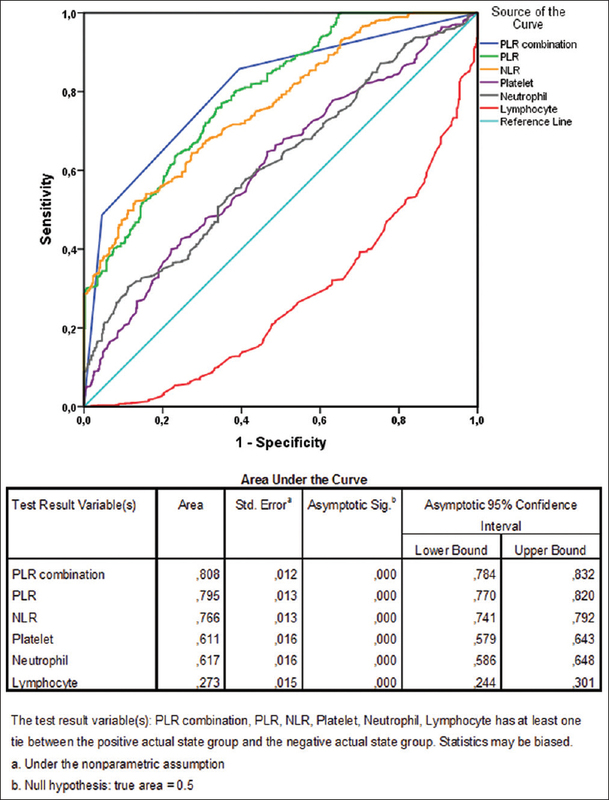 A scoring system was devised based on clinical, biochemical, and imaging parameters to predict the diagnosis of MS. Every positive parameter was given 1 point and patients rated on a scale of 0–10. Results: Score of 3 or more was found to have a 90% sensitivity of predicting MS among complicated cholecystitis. Similarly, a score of 6 or more had an 80% sensitivity of predicting Mirizzi's types II, III, and IV indicating fistulization. Jaundice, leucocytosis, associated choledocholithiasis/hepatolithiasis, intrahepatic biliary radical dilatation, meniscus sign and mass at confluence were found to be significant parameters. Conclusion: We propose a simple scoring system based on clinical, biochemical, and imaging parameters that can be useful for predicting MS in patients with complicated cholecystitis. Background/Aim: Gastric cancer is the third leading cause of cancer mortality worldwide. Human epidermal growth factor (Her-2/neu) has shown strong therapeutic implication in breast cancer. Although the prevalence of Her-2/neu over-expression in gastric cancer has been reported across the world, it is still unknown from South Asia. The aim of this study is to evaluate Her-2/neu expression in gastric adenocarcinomas and to correlate with various clinicopathological variables. Patients and Methods: A total of 95 consecutive patients undergoing endoscopic biopsy or gastrectomy were recruited in this study. Clinicopathological parameters of all patients were recorded and hematoxylin and eosin (H and E) staining was performed. Over-expression of Her-2/neu was investigated by immunohistochemistry using α-Her-2 antibody. To quantify Her-2/neu over-expression, the Hofmann validation scoring system was used and further its association was seen with age, gender, histopathological type, grade, and stage of the tumor. Data were entered and analyzed using SPSS version 21. A P value of <0.05 was considered as significant. 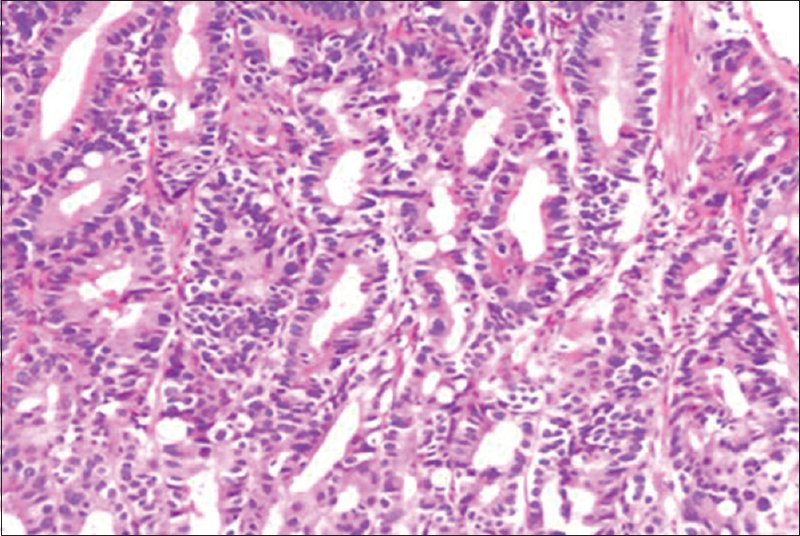 Results: Overall, 21 (22.1%) cases were positive for Her-2/neu overexpression from the total of 95 gastric adenocarcinomas. Her-2/neu was significantly expressed in low-grade gastric cancer (grade I = 50%, grade II = 34.5%, grade III = 14.5%; P = 0.030). Although there was insignificant difference between Her-2/neu over expression and other variables, Her-2/neu score 3+ was predominantly seen in females, age >60 years, Laurens intestinal type, and IIIC stage tumors. Conclusion: Her-2/neu is over-expressed in a limited group of gastric cancer patients in our population and indicates a significant strong association with low grades of gastric cancer. Background/Aim: The aim of this study was to investigate the role of the platelet-to-lymphocyte ratio (PLR)–neutrophil-to-lymphocyte ratio (NLR) combination, in the prediction of the presence of Helicobacter pylori (HP) and its associated complications in the gastrointestinal system. Patients and Methods: In all, 1289 patients who underwent esophagogastroduodenoscopy and biopsy for HP were included in the study. Results: The ratio of patients with moderate and severe chronic gastritis was higher in HP (+) group than HP (−) group. The ratio of patients with levels 1–3 atrophy and intestinal metaplasia was higher in HP (+) group. Compared with HP (−) group, HP (+) had higher PLR and NLR levels. The ratio of HP (+) patients was higher in high-risk group compared with low- and medium-risk groups. HP invasion stage, the intestinal metaplasia level, and the ratio of patients with atrophy level “3” were higher in high-risk group compared with low- and medium-risk groups. Regression analysis showed that the PLR–NLR combination was an independent risk factor for both HP presence and moderate and severe chronic gastritis. Conclusion: We found the PLR–NLR combination to be a good predictor of HP presence and gastrointestinal complications associated with HP. Background/Aims: COX2 and HER2 are shown to be critical in the regulation of cancer progression. However, the prognostic value of nuclear COX2 in colorectal cancer (CRC) and its relationship with HER2 still remains unknown. In this study, the expression and biological significance of COX2 and HER2 were evaluated in CRC at mRNA and protein levels. Materials and Methods: RNA-Seq data of CRC were downloaded from TCGA, and 229 CRC and 50 non-cancerous subjects were enrolled in this study. Bioinformatics and immunohistochemistry analysis was performed based on the obtained data. Survival analysis was conducted to identify factors associated with overall survival of CRC patients. Results: We showed that mRNA and protein levels of COX2 and HER2 were upregulated in CRC compared with the adjacent tissues. COX2 protein levels and nuclear COX2 expression were correlated with a poor prognosis of CRC patients. In addition, we also revealed that nuclear COX2 expression was positively associated with HER2 expression. Non-nuclear COX2 combined with low HER2 expression, was negatively correlated with Duke's stage and lymph node metastasis, predicting the best outcomes for CRC patients. In addition, our data indicated that non-nuclear COX2 combined with low HER2 expression is an independent prognostic factor for CRC after surgical resection. Conclusion: The study suggests that nuclear COX2 in combination with HER2 can serve as potential biomarkers for the clinical diagnosis and prognosis of CRC, and targeted inhibition of COX2 and HER2 might be an alternative strategy for the management of CRC.